Lynn is a Board-Certified Clinical Specialist in Neurologic Physical Therapy, is trained in neurodevelopmental treatment for adults with hemiplegia, and is a credentialed trainer for both APTA's Clinical Instructor Credentialing Level 1 and Level 2 programs. She collaborates in implementing individual student plans for clinical education, assists with neuromuscular therapeutics and coordinates the course on management of the medically complex patient. 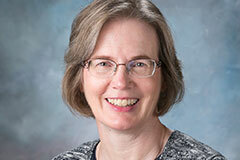 Her clinical practice includes acute care and rehabilitation. Sass K, Frank LM, Thiele A, Newton A, Hartung SJ, Bork B. Physical Therapy Clinicians' Perspectives on Clinical Education. Journal of Physical Therapy Education. 2011. 25(3):46-52.